Bill Nye, CEO of the Planetary Society, will serve as an honorary co-chair for the March for Science. Bill Nye, science celebrity and CEO of the Planetary Society, will serve as one of three honorary co-chairs for the March for Science that will take place in Washington, D.C., on April 22. "We will assemble with citizens everywhere, whether they are formal scientists or thoughtful citizens from other walks of life, to march in support of science," Nye wrote in a blog post on the Planetary Society website posted today (March 30). Satellite marches are planned in more than 400 additional locations around the world. The American Astronomical Society (AAS), which describes itself as the "major organization of professional astronomers in North America," also announced this week that it is now an official partner of the March for Science. More than 100 other scientific organizations have partnered with the march, including the American Physical Society and the American Geophysical Union. 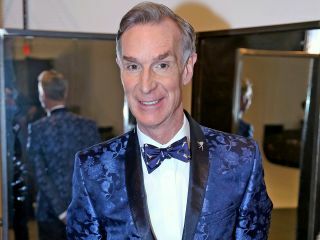 Since becoming a public figure in the 1990s with the success of his educational TV show "Bill Nye the Science Guy," Nye has been a public advocate for science and science literacy. The Planetary Society is a nonprofit, nonpartisan organization that advocates for space exploration and science education. It is, according to the society's website, "the world's largest and most influential nonprofit space organization." "One of the society's core values is science, the rigorous process that has enabled humankind to understand the cosmos and our place within it," Nye wrote in his blog post. "Science, and the technology that flows from it, has provided humans with the means to feed billions and know nature in a way that our ancestors could not have imagined. The Planetary Society's mission aligns with the mission of the March for Science." "The March for Science champions robustly funded and publicly communicated science as a pillar of human freedom and prosperity. We unite as a diverse, nonpartisan group to call for science that upholds the common good and for political leaders and policy makers to enact evidence-based policies in the public interest." Nye is joined by two other honorary co-chairs for the March: Mona Hanna-Attisha and Lydia Villa-Komaroff. Hanna-Attisha is "a pediatrician who exposed dangerous lead poisoning in Flint, Michigan," according to the march website. Villa-Komaroff is "a biologist who made critical contributions to producing insulin from bacteria, and the co-founder of the Society for Advancement of Chicanos/Hispanics and Native Americans in Science (SACNAS), a march partner." The appointment of two women of color to leadership positions for the march may help address issues of diversity and inclusion that the march organizers have struggled to solve since the group's inception, said an article in BuzzFeed. In addition to the main D.C. march there will be "upwards of 400 sister marches around the world," Nye wrote in the post, 317 of which will take place in the U.S. There are 32 satellite marches in California alone and 13 in Texas. The march website contains a complete list of satellite events. In his blog post, Nye discussed some exciting new developments in space exploration, while also mentioning the economic benefits of funding and supporting science. The post included three bolded phrases: "We march to celebrate science," "We march to celebrate space" and "We march to inspire unity."